A comprehensive guide on everything Bounce Rate, from how it is defined, to what an average bounce rate is. 1 What is Bounce Rate? 1.1 How is Bounce Rate Calculated? 1.2 How is Bounce Rate Measured? 2 What is an Average Bounce Rate? 3 What is a Good Bounce Rate for a Website? 4 What is a High Bounce Rate? 4.1 Is a High Bounce Rate Bad? 5.1 Who is Bouncing From My Site? 6 Does Bounce Rate Affect SEO? 8 Why is My Bounce Rate over 100%? The definition of a ‘bounce’ is a single-page session on your website. This means the user visits one page on your site and then exits. The formula for bounce rate is Bounces / Entrances. If 100 people visit your website and of those, 65 view just one page on your website and leave, then your Bounce Rate is 65%. The image above shows a screenshot of the metrics from one of our clients. This overview from Google Analytics shows us that the Bounce Rate for the past 30 days is 32.19%, so roughly 32 of every 100 visitors to the website only view one page before leaving. Bounce Rate is measured through your website analytics program. By far the most popular is Google Analytics, but there are good alternatives like Piwik, too. Both are free to use and easy to set up. Every time a webpage is loaded, the analytics code (which is embedded on every page of your website) will fire. If this code only fires once, then that session is recorded as a bounce. A bounce is always also an exit. However, an exit is not always a bounce. Confused? Let me explain. If you visit one page on a website and then leave, then you are a bounce. The first page you viewed was also the last page, so that page also chalks up an exit. If you visit two pages on a website, you cannot bounce. However, when you leave the website, the last page you clicked on gets recorded as the page you exited from and therefore that page scores an exit but in this instance no bounce. The average bounce rate by industry is an impossible question to answer accurately. There are lots of articles out there that claim to know what each industry sector’s Bounce Rate should be, but the fact is, it’s different for every site in every industry. The Daily Mail’s Bounce Rate is going to vary massively depending on where you are on the site. Likewise, The Times’ Bounce Rate will be very different to that of The Daily Mail’s, even though they are both British newspaper websites in the same industry. If you run multiple sites all in a similar niche (be they e-commerce, editorial, affiliate), you can calculate your own average Bounce Rate and work on improving the sites that are bouncing more than the rest. When we audit websites, we get a good feeling for the Bounce Rate of a certain industry, aiming at a certain demographic and using a set platform, like WordPress, Shopify, Magento but even so, Bounce Rates vary immensely. If your average Bounce Rate is lower than 10%: You’ve got tech issues (See The ‘Below 1%’ Bounce Rate Fallacy below). If your Bounce Rate is between 10 and 30%: That sounds good but I’d say you’re not trying hard enough. You are probably appealing to a small core of relatively loyal users but are not ranking high enough in search engines to pull in new potential customers. So if you decide to reach out more and generate more traffic, you’ll see your Bounce Rate increase but you will have more visitors and more opportunity to shape their relationship with your business. If your Bounce Rate is between 30% and 80%: Well done, you’ve got a happy and relatively healthy site. But there’s always room for improvement. The thing for you to do is to take a look at your individual pages and work on the ones with the overly high bounce rates. See Step 5 of our How to reduce Bounce Rate below, and tempt those one-user-one-page viewers into making another click. Grab the opportunity. If your Bounce Rate is 80% or above: You need to sweat your content a bit more. You might have lots of pages just doing their thing and then one or two pages bringing in a whole heap of new visitors but they’re not hanging around. This is a missed opportunity to show them what your site has to offer. We would say a high bounce rate would be around 80% or above. Depending on the type of website you are running, you might want to try and reduce this rate. If you’re running an e-commerce store then a high Bounce Rate is always bad, because your users will need to visit more than one page on your website in order to purchase a product. You cannot bounce from a website if you view more than one page, so we can safely assume that high-bouncing pages are missed selling opportunities. On the plus side, if you are getting bounces this also means that your site is getting page views. This is a good thing. Those visitors may not want to purchase on the first visit and so to an extent, a bounce is acceptable. However, you’re going to have to convert those window-shoppers to customers eventually and that will involve reducing your Bounce Rate. Bounce Rate on its own is a two-dimensional metric. You need to look at some other metrics to understand how people are engaging with your website and find where improvements can be made. Dwell time, also known as ‘Average Time on Page’ or ‘Average Session Duration’ is the amount of time a user spends on your website. In Google Analytics, if you go to: Audience > Overview you’ll see your Average Session Duration (dwell time) and Bounce Rate for every page on your site. The image below shows you a screengrab from one of our client’s Google Analytics profiles. 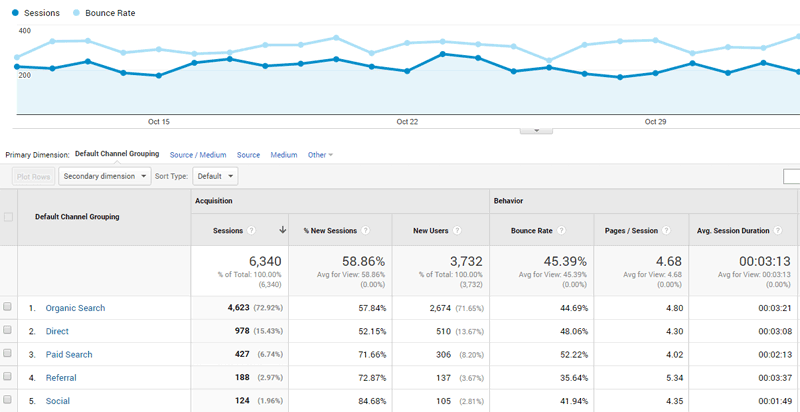 This audience Overview screen, shows the Session Duration and Bounce Rate. You’ll see to the top left of the image we have highlighted in green where you can select from the dropdown menu to map Bounce Rate against Sessions. You can then see fluctuations in Bounce Rate and compare this to Sessions. As a broad overview, this is a good report to look at, to get a feeling for how your visitors use your site. The cropped-in screenshot above, this time from a different client, shows that their average Bounce Rate for the site is 30.38%. The image shows the top pages, sorted by Pageviews. I’ve highlighted two different sets of results, one in green and two in yellow. Looking at the green result, we can see that page has had 2739 page views of which 1850 are unique (i.e 1850 devices have viewed that page 2739 times, meaning some people have returned and viewed that page multiple times on the same device). Move across a column and you see that the Average Time on Page is 1-minute 12 seconds. This is fairly healthy as it means that your users have been browsing that page. The Entrances are 1265, which means that for 1265 of the 1850 unique visitors, this was the first page of the site they landed on. This is good as it shows a deeper page on your site is being surfaced, either through Organic Search or perhaps Social channels or indeed your newsletter. The point is, they didn’t come here from another page on your site and this means they are ‘at risk’ of becoming a bounce and affecting your Bounce Rate. The good news is, only 51.54% of these users bounced. That’s no bad thing – you’ve retained half of your visitors. However, there is a definitely an opportunity here to reduce your Bounce Rate by encouraging your users to make an extra click. Looking at the yellow results, let’s go straight to the Bounce Rate: 92%. This is way higher than the site’s average of 30%. Now look back a column to the Entrances and compare this to the Unique Pageviews; for over 99% of people who visited these pages, these are the first pages they have viewed on this website. The high Entrance-to-Unique ratio is usually caused by a topic having a long-standing number-one position in Google or from a link from a high-traffic social site or referrer. So the 93%, it *looks* bad but now take a look at the Average Time on Page, it’s huge! Over 7 minutes and over 4 minutes respectively. This tells us that the pages are valuable – users are sticking around to read the content. However, there is a missed opportunity. I know that those two pages are instructional pages, they’re very detailed and the user is getting what they are looking for. But the site is missing a trick as they could be saying to the user: “Hey, if you thought that was useful, you ought to check these links out” or “Fill in your email address and we’ll send you this guide”. You’re almost over-serving the user on this one page, you’re getting a hell of a lot of ‘one-user-one-pageview’ visitors but you’re not showcasing them more of what your site has to offer. So in summary, a High Bounce Rate isn’t always bad but I always think of any bounce as a missed opportunity. Note: It’s important to note that Google is unable to record the time spent on bounced sessions. This is because Google can’t measure the amount of time spent on the last page viewed by a user. When looking at your session duration metrics you cannot tell how long a user spent on that page – whether they spent 10 seconds or 10 minutes – before exiting. However, it is possible to get an idea of how useful a page is to your users by looking at the average page view time of users who don’t bounce and assuming that your bouncing visitors are having a similar experience. Don’t panic if you see in your analytics that a page has 100% bounce rate and an average page view time of 0 – this does not mean that users are bouncing immediately from your site, but simply that Google obtained no data from those visitors because they all bounced. Who is Bouncing From My Site? This is an ecommerce client of ours and this report is gold dust when it comes to optimising Bounce Rate. It shows you the Bounce Rate of your site, defined by where the visitor came from, also known as the Source. If your Organic Search Bounce Rate is higher than the rest of your sources, you have a golden opportunity. If your site’s Bounce Rate is high, you need to work on your whole site. If one source is high, you need to put yourself into the mindset of the person visiting from that source. If your Organic Search Bounce Rate is high, it means you’re getting traffic from search engines but that traffic isn’t sticking around. For an ecommerce site, a high Bounce Rate from Organic means people are most likely seeing your products they’re just not buying. Go and check the Bounce Rate for individual pages at Behaviour > Site Content > All Pages and if it’s a content page that’s bouncing, that content isn’t helping you sell as well as it could. If it’s a product page that’s bouncing, think about why that may be. Are users landing on one colour with no clear path to other colours. Is the product marked as ‘out of stock’ or are important details like images or dimensions not shown. There are two schools of thought on whether bounce rate affects how your page ranks in search engines. In 2012, one-time company spokesman Matt Cutts stated in at an SMX conference that Google does not use bounce rate to determine a site’s ranking. This would make sense since Google is unable to track how long a user spent on that page. There is no way for Google to know whether a user bounced because the page they were served was irrelevant or that user found what they wanted and ended their browsing. While this may be the case, from our own experience dealing with bounce rate on our clients’ sites, Google Analytics data does seem to indicate a significant correlation between organic search traffic and bounce rate. For example, this is a screenshot of one of client’s Google Analytics data. The bounce rate is pretty much a mirror image of organic traffic – where bounce rate falls, traffic increases. However, it may not be that the lower bounce rate has caused the increase in website traffic. A lower bounce rate may not improve ranking in search engines on its own account. But we could probably say that bounce rate is a health warning of a website. A high bounce rate could mean that for some reason your website is off putting to users. Perhaps your landing page did not sufficiently answer the search query, or maybe your site is difficult to navigate. It is in search engine’s interests to provide a good experience for their users. Google does not want its users turning to Bing instead, for example. UX branches off into its own category of requirements, but essentially search engines reward companies that publish content that offers value to the reader, has a website that is easy to navigate on multiple devices, and is a reputable business people can trust. So if you have a high bounce rate it may be worth looking into some more ways to improve your user experience – and this will undoubtedly boost your SEO. Ultimately no one knows Google’s algorithm for ranking pages. We can just go on the correlations we see with regard to certain metrics and ranking. Find out more on how Google ranks website pages in our in depth article. These five simple steps will have a noticeable effect on lowering your site’s overall Bounce Rate. Head over to gtmetrix.net and put your website in there. Hit go and wait for the report. You can always change the variables to run the test from a country that your server is in, to get the ‘best’ possible scenario. Take a look at two elements: the page size and page load speed. If the load speed is over 3-seconds on a desktop, you need to work on this. In Google’s mobile-first world, websites with slow load times won’t rank as well as those with fast page speeds. If your page size is over 3MB, you need to look at where you can improve. All web pages are different and their sizes vary too but common culprits are images which aren’t optimised or, even worse, they are physically huge and then rescaled in your browser. Of course, every web page on your website will have a different size and load speed but all of your pages will have common code, which, when optimised will improve the load speed of every page on your site. Our website speed optimisation page shows you an overview of the different elements you can work on to improve page load times. We’ve all heard this a thousand times but it is still true. If you have the time or budget to write one 500-word article a week, then try writing one 1,000-word article every fortnight, or even better, one 2,000-word article every month. Length is not the be-all-and-end-all but if you’re going to cover a topic, cover it better than anyone else. Some people talk about 10x content or diamond content. Whatever you want to call it, remember to create content that’s far better than anything else out there, the sort of diamond in the rough. It is important to publish keyword specific content and deliver in-depth information visitors are most likely to want answers to, for a specific search term. It is also important that your content is well written and enjoyable to read. If you do this, you will likely reduce your bounce rate, improve your search engine rank as you start to get noticed by Google and be shared on social media. But more importantly, you’ll gain more conversions. This is really simple. A user that is a possible bouncer will be leaving your site on the very first page they came in on. Is it clear to that user who you are and what you do? Your website should have an aesthetically pleasing design that is easy to use. The site architecture should be logical and call to actions clearly signposted so visitors know where to go next. If end-users have to search for information they will give up and leave. If you’re an ecommerce store, do you have a clear breadcrumb structure that lets the user know that if the product page they landed on doesn’t quite tick all the boxes, they can take a chance on one more click taking them to a category that shows them what they need? If you’re a service provider, are you displaying the services related to the content that the user has come to your site to view? Don’t put your blog in a silo – make it central to everything your business exists to do. It’s 2017 and if your website isn’t responsive, i.e. it fits perfectly to the viewport of the user’s device then sorry buddy old pal, you’re going to slide down the rankings like you’re riding a waterslide on a huge bar of soap. Plus your visitors will be bouncing faster than LeBron James. If you’re in any doubt, head over to Google’s Mobile Test page. I’ve set it up to exclude all Entrances fewer than 5 for our time period (mine is set to a month but for a low-traffic site you can set this to a longer time period or reduce the Entrance figure from 5 to 3 and so on). The reason I’ve set 5 is that if you include 1 entrant who views one page that means your Bounce Rate is 100% and so it’s not that accurate as the next user might view two pages, meaning your BR is now 50%. Hit save and it’ll take you back to the report. This is another client’s website. It’s a relatively low-traffic website, with around 1,000 unique users a month. I’ve highlighted one of the results in green as it has a high number of entrances and an encouraging Average Time on Page. This looks like a great opportunity as the content is obviously good but we can encourage the user to make another click and therefore reduce the Bounce Rate. Deleting content may seem far-fetched but we’ve worked on client’s websites where around 20,000 of their 80,000 pages has a Bounce Rate of over 90%. These were thin, low-quality pages, which were ranking for ultra-low volume searches. The trouble is, users were giving out negative vibes, with high Bounce Rates, low session durations and a low rate of return. Killing-off these pages was a bold move but it had a huge effect on the site’s overall Bounce Rate. Sure, we lost a chunk of visitors but they were useless, merely ego-inflating for our overall stats. The best result of killing off these thin pages was that our crawl efficiency improved. Google seemed to like the fact that a higher percentage of our content was quality and in turn, our rankings improved across the whole site and our traffic recovered (I’m cautious not to say ‘bounced back’) to a higher level than before. Lots of SEO gurus disagree on this but when it comes to organic ranking (i.e. traffic from search engines) I’ve always seen a correlation between a lower bounce rate and higher overall traffic. There’s very little point in going to the effort of publishing great content, promoting it and letting it sit there, bouncing away. Every month you should check out your top-bouncing content and do what you can to improve your highest bouncing pages. Why is My Bounce Rate over 100%? You may have seen Google Analytics report a Bounce Rate of over 100% and if you know anything about Bounce Rate, you’ll know this can’t be possible, right? One person can’t enter an empty room and then more than one person walk out?! “Bounce rate is bounces/sessions, but sessions are counted only on the first hit of a session. If you have an event that triggers before the page view, the session count can get associated with the event. That leaves a bounce without a session causing the average rate to exceed 100%. I wince whenever a prospective client tells me they have a Bounce Rate lower than 1%. Beaming with confidence that ‘it’s proof people love their site’. It’s always hard to break it to them that they probably have two instances of Google Analytics code, clashing away. The images below are a bit of a ‘Rogues’ Gallery’ of suspiciously low Bounce Rates of websites we have audited. This is so common on WordPress; I would guess 1 in 10 of the sites we audit have this issue. WordPress is a great platform but due to the fact it’s easy to bolt-on plugins, sometimes two instances of Google Analytics code are loaded. Often the code is loaded into the header.php file and then the second instance is loaded via a plugin. Or sometimes you do only have one instance of GA tracking code but there’s a widget running in the sidebar (say, a subscription box) that’s actually an iframe loading another URL on your site, so the one-page load is actually loading two pages according to GA. The result is the same; GA fires twice, bang-bang and it’s now impossible for you to bounce. Your gloriously low Bounce Rate is, I’m afraid, a mirage. 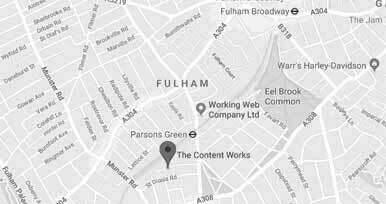 We’re The Content Works, a London SEO consultancy specialising in website audits. You can audit your own website using our simple guide (complete with PDF checklist) or we can carry out an in-depth audit for you. Our 120-point check uses cutting-edge tools and good old-fashioned manual testing – we prioritise your issues and discuss the best way to fix them. Got any questions? Call us on 0207 305 5599 or drop us a line using the contact form below.